The idea of gaining muscle and losing fat at the same time seems impossible because of three widely held misconceptions: (a) to gain muscle you need a calorie surplus; (b) to lose fat you need a calorie deficit; and (c) you cannot achieve a calorie surplus and deficit at the same time. Not too long ago, unfortunately I was in the right position to do some self-experiments in order to try to gain muscle and concurrently lose fat, without steroids, keeping my weight essentially constant (within a range of a few lbs). This was because I was obese, and then reached a point in the fat loss stage where I could stop losing weight while attempting to lose fat. This is indeed difficult and slow, as muscle gain itself is slow, and it apparently becomes slower as one tries to restrict fat gain. Compounding that is the fact that self-experimentation invariably leads to some mistakes. The photos below show how I looked toward the end of my transformation from obese to relatively lean (right), and then about 1.5 years after that (left). During this time I gained muscle and lost fat, in equal amounts. How do I know that? It is because my weight is the same in both photos, even though on the left my body fat percentage is approximately 5 points lower. I estimate it to be slightly over 12 percent (on the left). This translates into a difference of about 7.5 lbs, of “fat turning into muscle”, so to speak. A previous post on my transformation from obese to relatively lean has more measurement details (). Interestingly, I am very close to being overweight, technically speaking, in both photos above! That is, in both photos I have a body mass index that is close to 25. In fact, after putting on even a small amount of muscle, like I did, it is very easy for someone to reach a body mass index of 25. See the table below, from the body mass index article on Wikipedia (). 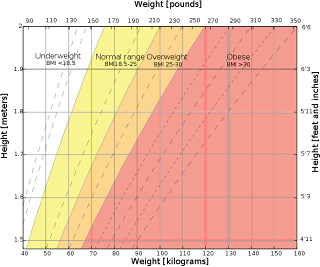 As someone gains more muscle and remains lean, approaching his or her maximum natural muscular potential, that person will approach the limit between the overweight and obese areas on the figure above. This will happen even though the person may be fairly lean, say with a body fat percentage in the single digits for men and around 14-18 percent for women. This applies primarily to the 5’7’’ – 5’11’’ range; things get somewhat distorted toward the extremes. Contrast this with true obesity, as in the photo below. This photo was taken when I was obese, at the beach. 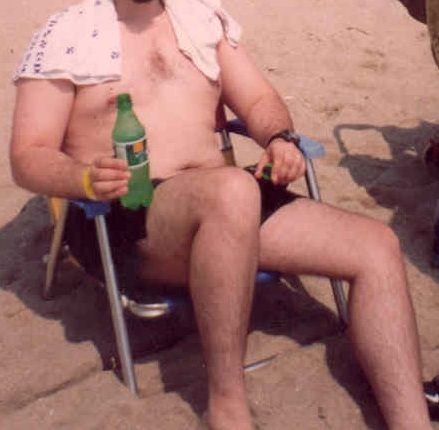 If I recall it properly, it was taken on the Atlantic City seashore, or a beach nearby. I was holding a bottle of regular soda, which is emblematic of the situation in which many people find themselves in today’s urban societies. It reminds me of a passage in Gary Taubes’s book “Good Calories, Bad Calories” (), where someone who had recently discovered the deliciousness of water sweetened with sugar wondered why anyone “of means” would drink plain water ever again. Now, you may rightfully say that a body composition change of about 7.5 lbs in 1.5 years is pitiful. Indeed, there are some people, typically young men, who will achieve this in a few months without steroids. But they are relatively rare; Scooby has a good summary of muscle gain expectations (). As for me, I am almost 50 years old, an age where muscle gain is not supposed to happen at all. I tend to gain fat very easily, but not muscle. And I was obese not too long ago. My results should be at the very low end of the scale of accomplishment for most people doing the right things. By the way, the idea that muscle gain cannot happen after 40 years of age or so is another misconception; even though aging seems to promote muscle loss and fat gain, in part due to natural hormonal changes. There is evidence that many men may experience of low point (i.e., a trough) in their growth hormone and testosterone levels in their mid-40s, possibly due to a combination of modern diet and lifestyle factors. Still, many men in their 50s and 60s have higher levels (). And what are the right things to do if one wants to gain muscle and lose fat at the same time? In my next post I will discuss the misconceptions mentioned at the beginning of this post, and a simple approach for concurrently gaining muscle and losing fat. The discussion will be based on my own experience and that of several HCE () users. The approach relies heavily on individual customization; so it will probably be easier to understand than to implement. Strength training is part of this simple strategy. One puzzling aspect of strength training, from an evolutionary perspective, is that people tend to be able to do a lot more of it than is optimal for them. And, when they do even a bit more than they should, muscle gain stalls or even regresses. The minimalists frequently have the best results. In my previous post () I discussed some country data linking pork consumption and health, analyzed with WarpPLS (). One of the datasets used, the most complete, contained data from Nationmaster.com () for the following countries: Australia, Brazil, Canada, China, Denmark, France, Germany, Hong Kong, Hungary, Japan, Mexico, Poland, Russia, Singapore, Spain, Sweden, United Kingdom, and United States. That previous post also addressed a study by Bridges (), based on country-level data, suggesting that pork consumption may cause liver disease. In this post we continue that analysis, but with a much more complex model containing the following country variables: wealth (PPP-adjusted GNP/person), pork consumption (lbs/person/year), alcohol consumption (liters/person/year), obesity (% of population), and life expectancy (years). The model and results, generated by WarpPLS, are shown on the figure below. (See notes at the end of this post.) These results are only for direct effects. WarpPLS also calculates total effects, which are the effects of each variable on any other variable to which it is linked directly and/or indirectly. Two variables may be linked indirectly, through various paths, even if they are not linked directly (i.e., have an arrow directly connecting them). Another set of outputs generated by the software are effect sizes, which are calculated as Cohen’s f-squared coefficients. The figure below shows the total effects table. The values underlined in red are for total effects that are both statistically significant and also above the effect size threshold recommended by Cohen to be considered relevant (f-squared > 0.02). Pork consumption is negatively associated with obesity, which is interesting. So is alcohol consumption, but much less strongly than pork consumption. This does not mean that if you eat 20 doughnuts every day, together with 1 lb of pork, you are not going to become obese. What this does suggest is that maybe countries where pork is consumed more heavily are somewhat more resistant to obesity. Here it should be noted that pork is very popular in Asian countries, which are becoming increasingly wealthy, but without the widespread obesity that we see in the USA. But it is not the inclusion of Asian countries in the dataset that paints such a positive picture for pork consumption vis-à-vis obesity, and even weakens the association between wealth and obesity so much as to make it statistically non-significant. Denmark is a wealthy country that has very low levels of obesity. And it happens to have the highest level of pork consumption in the whole dataset: 142.6 lbs/person/year. So we are not talking about an “Asian paradox” here. More like a “pork paradox”. Finally, as far as life expectancy is concerned, the key factors seem to be wealth and obesity. Wealth has a major positive effect on life expectancy, while obesity has a much weaker negative effect. Well, access to sanitation, medical services, and other amenities of civilization, still trumps obesity in terms of prolonging life; however miserable life may turn out to be. The competing effects of these two variables (i.e., wealth and obesity) were taken into consideration, or controlled for, in the calculation of total effects and effect sizes. The fact that pork consumption is negatively associated with obesity goes somewhat against the idea that pork is inherently unhealthy; even though pork certainly can cause disease if not properly prepared and/or cooked, which is true for many other plant and animal foods. The possible connection with liver problems, alluded to in the previous post, is particularly suspicious in light of these results. Liver diseases often impair that organ’s ability to make glycogen based on carbohydrates and protein; that is, liver diseases frequently lead to liver insulin resistance. And obesity frequently follows from liver insulin resistance. Given that pork consumption appears to be negatively associated with obesity, it would be surprising if it was causing widespread liver disease, unless its relationship with liver disease was found to be nonlinear. (Alcohol consumption seems to be nonlinearly associated with liver disease.) Still, most studies that suggest the existence of a causal link between pork consumption and liver disease, like Bridges’s (), hint at a linear and dose-dependent relationship. - Country-level data is inherently problematic, particularly when simple models are used (e.g., a model with only two variables). There are just too many possible confounders that may lead to the appearance of causal associations. - More complex models ameliorate the above situation somewhat, but bump into another problem associated with country-level data – small sample sizes. We used data from 18 countries in this analysis, which is more than in the Bridges study. Still, the effective sample size here (N=18) is awfully small. - There were some missing values in this dataset, which were handled by WarpPLS employing the most widely used approach in these cases – i.e., by replacing the missing values with the mean of each column. The percentages of missing values per variable (i.e., column) were: alcohol consumption: 27.78%; life expectancy: 5.56%; and obesity: 33.33%. Recently Paul Jaminet wrote a blog post on the possible link between pork consumption and cirrhosis (). Paul should be commended for bringing this topic to the fore, as the implications are far-reaching and very serious. One of the key studies mentioned in Paul’s post is a 2009 article by Bridges (), from which the graphs below were taken. The graphs above show a correlation between cirrhosis and alcohol consumption of 0.71, and a correlation between cirrhosis and pork consumption of 0.83. That is, the correlation between cirrhosis and pork consumption is the stronger of the two! Combining this with the Nanji and French study, we have evidence that: (a) in countries with low alcohol consumption we can find a significant correlation between cirrhosis and pork consumption; and (b) in countries where both alcohol and pork are consumed, pork consumption has the strongest correlation with cirrhosis. Do we need anything else to ban pork from our diets? Yes, we do, as there is more to this story. Clearly alcohol and pork consumption are correlated as well, as we can see from the graphs above. That is, countries where alcohol is consumed more heavily also tend to have higher levels of pork consumption. If alcohol and pork consumption are correlated, then a multivariate analysis of their effects should be conducted, as one of the hypothesized effects (of alcohol or pork) on cirrhosis may even disappear after controlling for the other effect. I created a dataset, as best as I could, based on the graphs from the Bridges article. (I could not get the data online.) I then entered it into WarpPLS (). 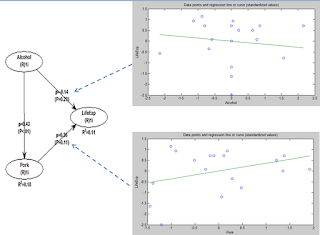 I wanted to run a moderating effect analysis, which is a form of nonlinear multivariate analysis. This is important, because the association between alcohol consumption and disease in general is well known to be nonlinear. In fact, the relationship between alcohol consumption and disease is often used as a classic example of hormesis (), and its characteristic J-curve shape. Since correlation is a measure of linear association, the lower correlation between alcohol consumption and cirrhosis, when compared with pork consumption, may be just a “mirage of linearity”. In multivariate analyses, this mirage of linearity may lead to what are known as type I and II errors, at the same time (). I should note that the Bridges study did something akin to a moderating effect analysis; through an analysis of the interaction between alcohol and pork consumption. However, in that analysis the values of the variables that were multiplied to create a “dummy” interaction variable were on their original scales, which can be a major source of bias. A more advisable way to conduct an interaction effect analysis is to first make the variables dimensionless, by standardizing them, and then creating a dummy interaction variable as a product of the two variables. That is what WarpPLS does for moderating effects’ estimation. 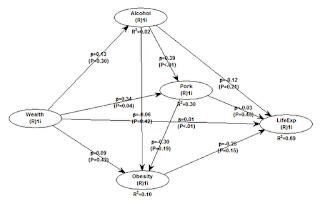 Below are the results of a multivariate analysis on a model that incorporates the above implication, by including a link between alcohol and pork consumption. The model also explores the role of pork consumption as a moderator of the relationship between alcohol and cirrhosis, as well as the direct effect of pork consumption on cirrhosis. Finally, the total effects of alcohol and pork consumption on cirrhosis are also investigated; they are shown on the left. The total effects are both statistically significant, with the total effect of alcohol consumption being 94 percent stronger than the total effect of pork consumption on cirrhosis. Looking at the model, alcohol consumption is strongly associated with pork consumption (which is consistent with Jeanneret and colleagues’s study). Alcohol consumption is also strongly associated with cirrhosis, through a direct effect; much more so than pork. Finally, pork consumption seems to strengthen the relationship between alcohol consumption and cirrhosis (the moderating effect). As we can see the relationship between pork consumption and cirrhosis is still there, in moderating and direct effects, even though it seems to be a lot weaker than that between alcohol consumption and cirrhosis. Why does pork seem to influence cirrhosis at all in this dataset? Well, there is another factor that is strongly associated with cirrhosis, and that is obesity (). In fact, obesity is associated with just about any major disease, including various types of cancer (). And in countries where pork is a dietary staple, isn’t it reasonable to assume that pork consumption will play a role in obesity? Often folks who consume a lot of addictive industrial foods (e.g., bread, candy, regular sodas) also eat plenty of foods with saturated fat; and the latter end up showing up in disease statistics, misleadingly supporting the lipid hypothesis. The phenomenon involving pork and cirrhosis may well be similar. But you may find the above results and argument not convincing enough. Maybe you want to see some evidence that pork is actually good for one’s health. The results above suggest that it may not be bad at all, if you buy into the obesity angle, but not that it can be good. So I downloaded the most recent data from Nationmaster.com () on the following variables: pork consumption, alcohol consumption, and life expectancy. The list of countries was a bit larger than and different from that in the Bridges study; the following countries were included: Australia, Brazil, Canada, China, Denmark, France, Germany, Hong Kong, Hungary, Japan, Mexico, Poland, Russia, Singapore, Spain, Sweden, United Kingdom, and United States. Below are the results of a simple multivariate analysis with WarpPLS. 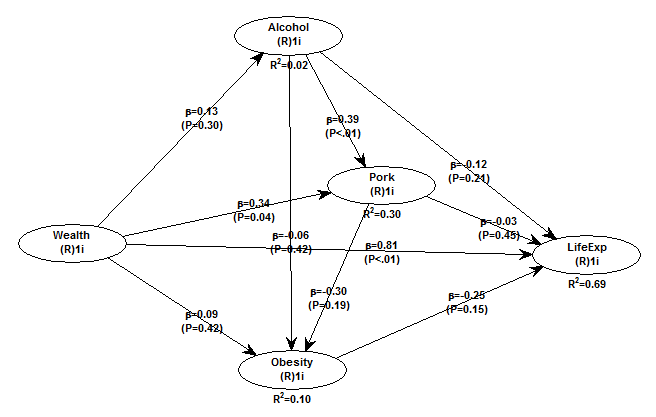 As with the Bridges dataset, there is a strong multivariate association between alcohol and pork consumption (0.43). The multivariate association between alcohol consumption and life expectancy is negative (-0.14). The multivariate association between pork consumption and life expectancy is positive (0.36). Neither association is statistically significant, although the association involving pork consumption gets close to significance with a P=0.11 (a confidence level of 89 percent; calculated through jackknifing, a nonparametric technique). 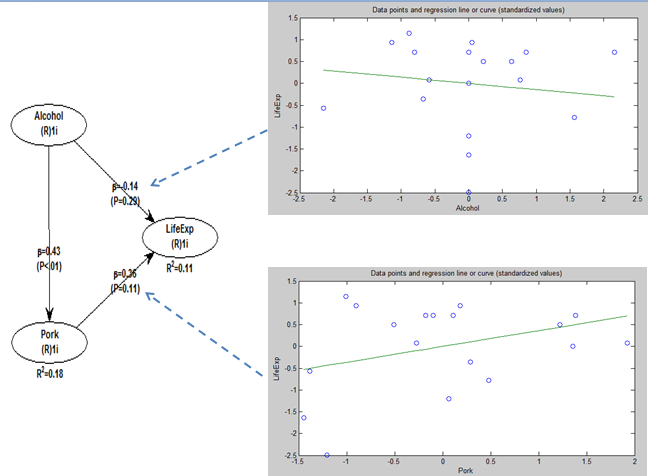 The graphs show the plots for the associations and the best-fitting lines; the blue dashed arrows indicate the multivariate associations to which the graphs refer. So, in this second dataset from Nationmaster.com, the more pork is consumed in a country, the longer is the life expectancy in that country. In other words, for each 1 standard deviation variation in pork consumption, there is a 0.36 standard deviation variation in life expectancy, after we control for alcohol consumption. The standard deviation for pork consumption is 36.281 lbs/person/year, or 45.087 g/person/day; for life expectancy, it is 4.677 years. Working the numbers a bit more, the results above suggest that each extra gram of pork consumed per person per day is associated with approximately 13 additional days of overall life expectancy in a country! This is calculated as: 4.677/45.087*0.36*365 = 13.630. Does this prove that eating pork will make you live longer? No single study will “prove” something like that. Pork consumption is also likely a marker for wealth in a country; and wealth is strongly and positively associated with life expectancy at the country level. Moreover, when you aggregate dietary and disease incidence data by country, often the statistical effects are caused by those people in the dietary extremes (e.g., alcohol abuse, not moderate consumption). Finally, if people avoid death from certain diseases, they will die in higher quantities from other diseases, which may bias statistical results toward what may look like a higher incidence of those other diseases. What the results summarized in this post do suggest is that pork consumption may not be a problem at all, unless you become obese from eating it. How do you get obese from eating pork? Eating it together with industrial foods that are addictive would probably help.